A prospect can have all the puck skills in the world, but it’s not uncommon for players who regularly put up 100-point seasons in the CHL struggle to crack NHL lineups. The difference between true NHLers and a career minor leaguer can often be chalked up to one ability – skating technique. Over the last few years, EA’s NHL franchise has underperformed like one of these plodding prospects largely due to the same factor. The players felt slow and unresponsive, a far cry from the burst and agility we see from NHL stars. With a new skating system, NHL 19 shows dramatic improvement in this crucial area, and the effects are felt across every mode in the robust package. Gone are the lumbering skaters who turn like the Titanic. The new skating system makes it easier to turn directions, burst out of stops, and control movement in tight spaces, making this the most responsive skating system yet. 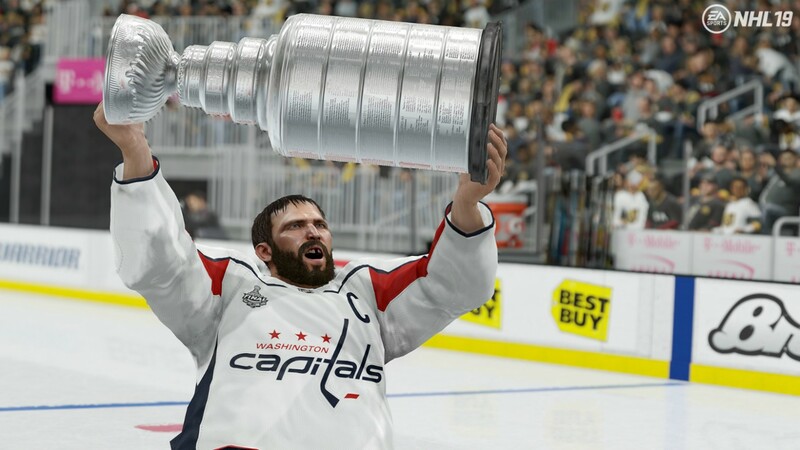 Best of all, the new approach to skating has also helped EA largely overcome the longstanding puck pickup problem that has plagued the series. The skating may be the star of NHL 19, but the new collision physics gets the assist. The physical side of hockey feels and looks better than ever, from small incidental contact where you inhibit a rival’s movement to wince-inducing big hits that leave victims stunned on the ice. I saw the occasional awkward animation, particularly around the goal mouth, but overall players react more naturally to contact. The impact of these changes cannot be understated, as they change the feel of the game through the myriad modes in NHL 19. Still, the gameplay isn’t perfect. Poke checking is dramatically nerfed, which takes time to get used to, but in the meantime expect poke check spammers to rack up more penalty minutes than a checking line featuring Marty McSorley, Tie Domi, and Dale Hunter. Time will tell if the changes went too far for most people to reign in the pokes, but it requires rethinking your approach to defense. My use of the defensive skill stick and stick lifts increased as a result, and I’m down to a penalty or two a game, so it can be done. The teammate A.I. could also use some lessons at a hockey academy. Attackers don’t demonstrate much creativity, teammates lack cycling support, and I frequently saw legacy EASHL issues like A.I. defenders accidentally skating into their own goaltenders or foolishly joining the offensive rush and leaving the team wide open to unimpeded counterattacks. The flagship new mode for NHL 19 is World of Chel, a one-stop shop for all your online teamplay needs. From this new hub, you can create a skater to take into the popular EASHL competitive mode, drop-in games for the arcade Threes mode, or the new Ones competition, which puts three skaters on the ice in a festival outdoor atmosphere where they square off to show off their puck hogging skills and try to score the most goals in a set amount of time. Winners rise up the ranks to earn special accolades, but EA curiously chose to limit it to online only even though it's perfectly suited to couch co-op play. I’d much rather play this bragging-rights mode with friends than randoms. Newcomers intimidated by the competition can also sharpen their skills in a breezy Pro-Am mode that pits you against waves of A.I. controlled modern stars and NHL legends. This is a decent onboarding experience, but it offers nothing but some easy progression upgrades for series veterans, who are better off sticking with the largely unchanged EASHL. One caveat: 3v3 and 6v6 drop-ins only work sporadically, and I experienced several matchmaking drops in EASHL play. These problems weren’t nearly as prevalent during the recent beta, so this should hopefully be resolved in short order. Whichever mode you play, you earn experience that rewards you with new skills and bags of customization options. The skill customization is a welcome step up from the milquetoast fixed archetype system of previous games that gave you no say in how your skater performed. Being able to mix-and-match unlocked traits and specialties and see how exactly they affect your ratings allows you to tailor a skater to more accurately fit your playing style. It’s a nice step forward, but I’d still prefer a more robust player upgrade path like NBA 2K (or Live) that allows you to rank up and play a career mode with your created character as well. NHL 19 still includes the standalone Be A Pro mode, but adding skill trees doesn't do enough to spruce up the experience; it's time for a serious reboot. Integrating the next effort into World of Chel and offering more various activities that use the cool outdoor settings seems like a natural evolution. Franchise mode fans frustrated by years of neglect have a lot to look forward to in NHL 19 thanks to the reworked scouting system. Users now control a stable of up to 20 scouts responsible for finding the next diamond-in-the-rough prospects as well as keeping tabs on rival teams’ rosters so you know when a trade offer is either an attempt to fleece you of a good player or worthy of series consideration. I love how granular you can get with the new system; I meticulously micromanaged the scouting of players in positions of organizational weaknesses and was able to continually pull in excellent draft classes. Being able to generate five different types of reports on the prospects gives you a lot of points of differentiation when deciding between two players of similar skill, and I loved seeing how both my own prospects and the ones I wanted to take in the draft but got selected before my pick turned out. The Fog of War system is also a welcome improvement. If you’re not keeping tabs on rival teams’ prospect pools and upcoming free agents over time, you can make the kind of organizational missteps that could make you Mark Bergevin’s new rival as worst GM in hockey. Both the scouting and Fog of War system could use some quality of life notifications where scouts offer valuable insight to help guide the process and make sure you aren’t neglecting something serious (like scouting upcoming free agents before the spending spree begins), but I appreciate how much more it demands of me as the GM. Your biggest headaches this year come in the form of the unpredictable player morale system, which still isn’t where it needs to be to add value to the experience. For those who prefer a more fantasy-oriented approach to team building, Ultimate Team returns reinvigorated thanks to a healthy injection of NHL legends and a new objectives system that rewards you coins for completing various goals. These additions are nice, but the mode still lacks the variety of single-player challenges you see in FIFA and Madden. The auction system needs to be burned to the ground and rebuilt as well; not being able to track the bids from one simple screen is maddening when you see how much better the experience is in the other versions of Ultimate Team. NHL 19 still has its share of legacy issues that need attention, but the vastly improved skating and physics make this the best playing hockey game of the generation. The scouting system gives franchise mode a much-needed makeover, and while World of Chel feels like a half-built theme park right now, I’m excited about its future prospects. If you haven’t played an NHL game in a while, this is the year to jump back over the boards. Welcome improvements to the general gameplay and franchise mode make this the best NHL in years.